This first version (above) shows the appliques laid out in rows on top of the background. The second version shows putting additional layers on the hearts, stars, and hexies. Finally, the third version of the AccuQuilt GO! 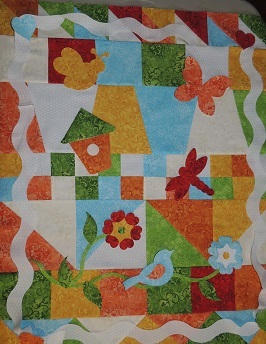 Pattern Series shows a completely random layout of the appliques over the background and the addition of a large “rick-rack” border in white. Which layout(s) do you like best? 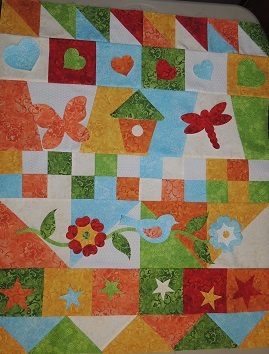 The pattern will show lots of different ideas on how you can lay out your own quilt. It is really fun to just play and be creative. Every quilt made from this pattern will truly be one of a kind. Stay tuned as I continue to develop this pattern – we are far from done with it! Next we are going to explore ways to enlarge the whole pattern into more size options without adding any more pattern pieces except optional borders. Did you miss part one, two of three of our AccuQuilt GO! Pattern Series? You can find them here… It’s really fun to see the design as it progresses. 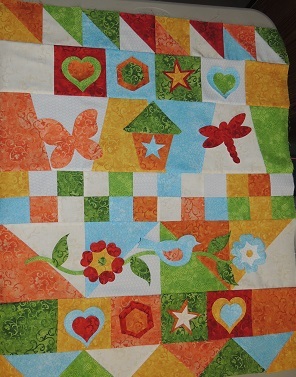 This entry was posted in AccuQuilt GO!, Designers, patterns, QuiltWoman and tagged AccuQuilt GO!, AccuQuilt GO! Quilt Patterns, Nancy Dill, QuiltWoman.com. Bookmark the permalink.